Urban honey is twice as sweet. 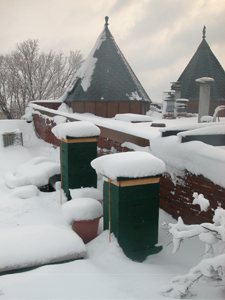 MaryEllen wrote the following article, which seems to answer, so well, one of the most common questions a beekeeper receives (and a really good, important question, too): "How do honeybees survive the winter?" While there is little activity out in the beeyard in January, the bees inside their hives are busy clustering for warmth. Maintaining the proper nest climate at any time of year is a very dynamic and complex task. Not only must the bees react to the small fluctuations that occur from moment to moment in a given day, but to the enormous fluctuations that would occur from season to season while nest activities are changing as well. Consider also that a honey bee colony made up of tens of thousands of individual bees controls the climate on the combs in their hive without the benefit of any centralized leadership. Bees have in place no hierarchical decision making structure or governing body, nor can they, given the widely dynamic nature of their environment, be following any ingrained or instinctual master plan. The winter cluster is made up of hot, cold and comfortable bees. Despite the fact that regulating the temperature within the nest is an activity that requires the participation of the entire population, researchers do not believe that the bees are working cooperatively. Research indicates that each individual bee in a cluster could be basing her behavior on nothing more complicated than her own body temperature at any given moment. The temperature within the winter cluster is not uniform. The bees on the outside of the cluster, called the mantle, are colder than the bees toward the center, or at the core of the cluster. Clusters are not necessarily spherical in shape either. Each bee seeks to keep her own body in a comfortable temperature range. If a bee’s body is in the comfortable range, she is free to engage in a bee activity other than thermoregulation. If her body is cold, she seeks to get warm, and if she is at the center of the cluster and she is warmer than is comfortable, she will seek to move to an area where she can cool down. To conserve food reserves, bees in a winter cluster seek to maintain their body temperatures lower than they would in the summer or in the other seasons when they are actively rearing brood. Winter bees hold more fat in their bodies than bees at any other time of year, and there are differences in their hemolymph from that of their summer sisters that make it easier for winter bees to tolerate a lower temperature range. During the coldest periods, the bees in the cluster generate heat metabolically by shivering, but it is not the shivering alone that increases the temperature in the center of the cluster. The bees on the mantle cling more tightly together and move less as the ambient temperature decreases. Tightly packed bees that are not moving provide better insulation than a looser layer of moving bees, so the cluster becomes more resistant to heat loss and the temperature in the core of the cluster continues to rise. Bees at the core become overheated and in moving to cool themselves, they relieve the heat at the core by circulating the heat. This natural movement of the bees helps to prevent the bees that make up the mantle from going into a chill coma and dying, and all of this takes place without the bees from the core of the cluster communicating with the bees in the mantle.